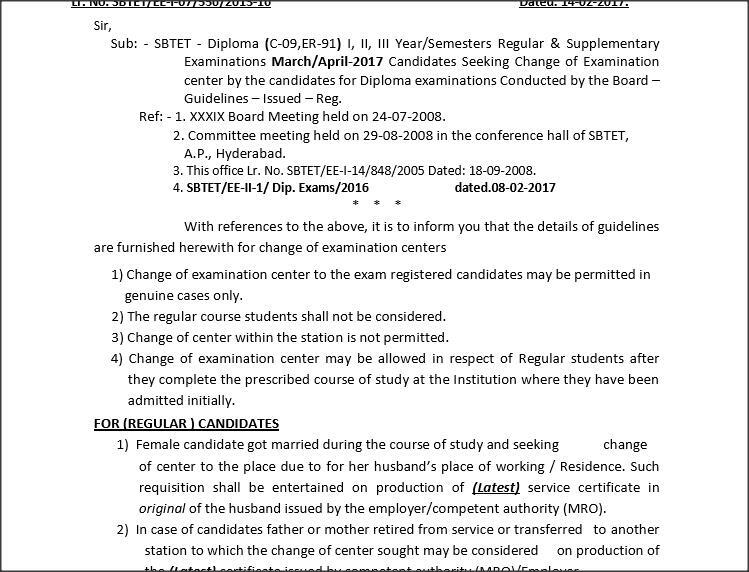 1) Change of examination center to the exam registered candidates may be permitted in genuine cases only. 1) Female candidate got married during the course of study and seeking change of center to the place due to for her husband’s place of working / Residence. Such requisition shall be entertained on production of (Latest) service certificate in original of the husband issued by the employer/competent authority (MRO). 3) Change of Center may be considered on the priority of category of employment. 4) a). Change of centre may be allowed only when the branch studied by the candidate is offered in the proposed examination centre. b) Change of Center may be allowed as many times as the candidate desires subject to production of certificates and payment of fee for each notification. c). Change of examination center may be allowed from Govt. Polytechnic to another Govt. Polytechnic only and from Private Polytechnic to Govt. Polytechnic within the state(only) as per their request. However change of examination center from Govt. to Private and Private to Private Polytechnic/Institutions shall not be allowed. 5) Filtration of applications and allocation of examination centers shall be under taken by the Board. 6) The candidates applied under late fee and Tatkal Scheme shall not be allowed for such change of examination center. 7) The change in examination center shall be limited to 10% of sanctioned intake per Branch / Institution at which center the candidate seeking to appear for examination. 8) The above shall be decided on first come first served basis. 9) The change in examination center will be granted only on payment of fee through D.D in favour of “THE SECRETARY, SBTET, T.S” payable at Hyderabad from any Nationalized bank. Rs. 500/- per Regular candidates (Day-time). The Principals are requested to inform the candidates to submit the application along with necessary certificates and required fee as mentioned above to this office on or before 28/02/2017 so as to enable this office to process the applications based on the guidelines mentioned above. Applications will not be entertained under any circumstances after prescribed date through institution or from the candidates who apply directly to this office.